Empire Pheonix is the latest new condominium located in the exciting Mystic Point location. We were lucky to catch up with Dan Flomen (Executive VP, Empire Communities) ahead of the launch. Flomen has been involved with every aspect of Empire Maverick; from site acquisition, to design, to intricately designing the floor plans, and now to the launching the condominium for sale. Flomen shares some amazing insights on this exciting new condominium. 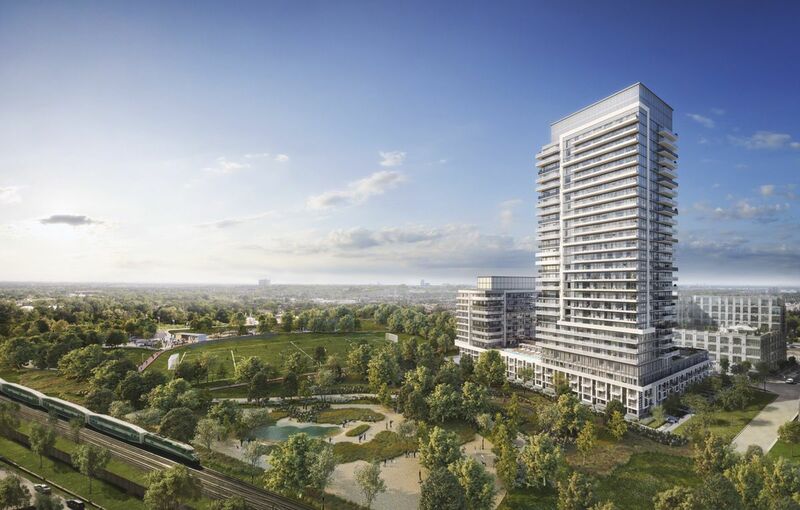 Amit Bhandari: Hi there, this is Amit Bhandari of talkcondo.com and today we’re at Humber Bay in the future Presentation Center for Phoenix Condominiums by Empire Communities. And we’re actually sat with Dan Flomen, who is the Executive Vice President of Empire Communities. Thank you so much. Dan Flomen: Pleasure. Thank you for coming. It’s an office that’s under construction, I appreciate you coming here, getting your suit all dirty. Amit Bhandari: Oh I know, it’s okay. Dan Flomen: We even got the fireplace turned on at least. Amit Bhandari: I know. At least we have that going. Dan Flomen: We’ve got construction in the back, construction in the front. So it’s a little bit noisy, but I’m really glad you took time out to come down here. Amit Bhandari: Well, and you know we’re really excited to see it once it’s all complete and everything because the space is incredible. So Dan, I wanted to, obviously, talk to you about Phoenix Condos. But before that, I wanted to talk about Empire Communities. Because as a developer, you’ve got a pheromonal portfolio right across Ontario, I don’t know if there’s anyplace that you’ve left untouched. Dan Flomen: Well let me stop you there, from Niagara Falls to Scarborough. From Kitchener or Waterloo, to Hamilton to Brantfort, one of our flagship. We’ve built tens of thousands of houses and then in Toronto we’ve sold thousands and thousands of condos. In fact, just down the street we’ve built a project called Beyond The Sea, which has almost 900 units. You’re sitting in the former sales office of Eau Du Soleil, which is a 1280 unit building and two towers, a 67 story and a 50 story tower, combined by a podium. And Eau Du Soleil is the tallest building on the water in Canada. 67 stories, with a huge mechanical penthouse. And then in Toronto we’ve built. And then at Finch, we’ve built. Again, in Scarborough. We’ve built downtown, the Modern on Sherbourne. So we have a lot of experience building condos within Toronto, and houses throughout Ontario. Dan Flomen: And it’s important to know that we are our own builder. Amit Bhandari: I was just gonna touch on that. Dan Flomen: Yeah. It’s important to know that one of the big things is we don’t rely on a general contractor to come in after the fact. We do our own excavation, we do our own construction, so that we know all of our costs, and all of our product, and all of our finish’s going in. We don’t rely on a third party to come in and do any of that. So we have a good understanding going in, of what the final product is gonna be, and we’re able to build to that final product. Amit Bhandari: And that goes way back, historically as well as in the standard? Dan Flomen: Well Empire’s been around for 25 years. This is actually our 25th anniversary. But before Empire, the founders father founded a company called York Excavation, one of the largest excavators in Ontario, doing everything from Sky Dome to major buildings throughout the city to Scotia tower. So very, very large projects. So the owners all come from, lets say a second generation of people in the industry, and even some of us Senior Executives, my late father was one of the largest electrical contractors in Canada. Commercial electrical contractors in Canada. Dan Flomen: So we all have a background, and a real understanding of construction and our jobs. Be it finance or accounting. Amit Bhandari: So it’s in your blood? Dan Flomen: It’s in our blood. Dan Flomen: You can’t get rid of it. Amit Bhandari: So you touched on a couple of projects, major projects. We’re literally behind the biggest, Waterford Towers, in Canada. Amit Bhandari: And I believe it’s only halfway up right now and it looks phenomenal. Dan Flomen: Yeah, when you look up you can’t believe how tall it’s gonna be. Amit Bhandari: I know. So the scope and magnitude of this, and then the other previous towers that you mentioned as well, Beyond the Sea. So you’ve got at lot of expertise, experience, building within this neighborhood? Dan Flomen: Absolutely. 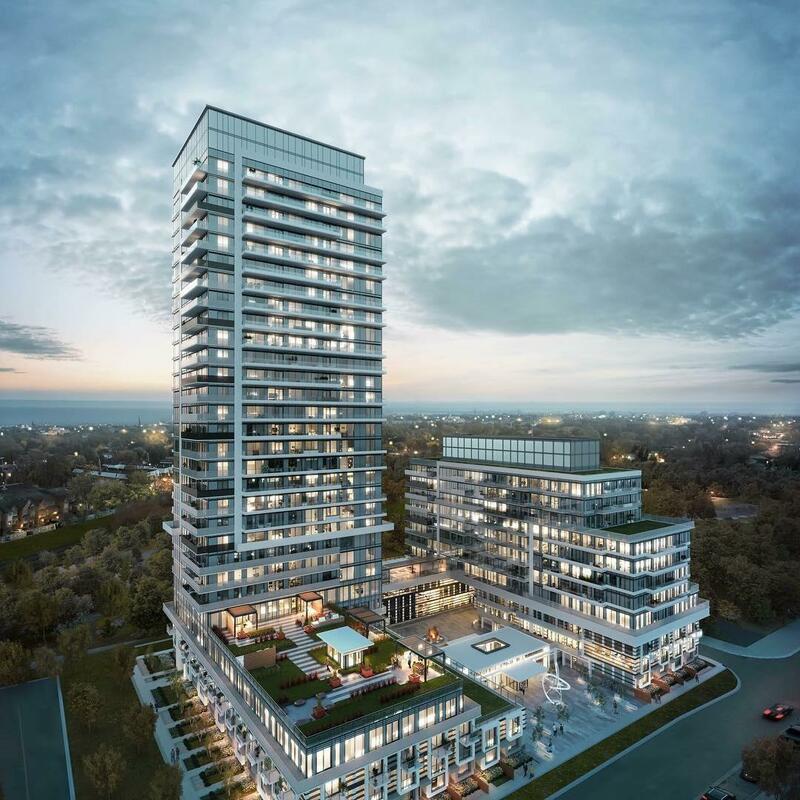 We are probably one of the largest builders in this Mimico, Humber Bay, Mystic Point area. And that leads us to the project, our project called Phoenix. Amit Bhandari: Where you don’t really have a whole bunch of residential buildings. You cross the street and you’re right at Lake Ontario with the phenomenal views. Amit Bhandari: You don’t look that old. Dan Flomen: Thank you. A little too little, too late on that one. So I’ve been 14 years working within the Mystic Point community and I love it. It’s a pocket within the area that is so secluded. For example, there’s two parks right there. You can see Lake Ontario from there. But you don’t have a lot of the major traffic that you have in other areas. Because unless you rally live in Mystic Point, you’re not gonna go into the Mystic Point community. Amit Bhandari: All the way around. Yeah. Dan Flomen: Yeah. You’ll have a direct access. That alone will add so much value to this community. Dan Flomen: Via the existing condos that make up it, and the future ones that we’re going to be building. It’ll be such a huge asset to the residence, be it the owners, the tenants. Just for walking. Just for biking. Just for rollerblading. You can’t see it now, but there’s people rollerblading up and down the streets here. So now they’ll be able to Rollerblade from there straight down here without having to drive down here, huge asset. Amit Bhandari: No, amazing. And accessibility is such a big deal. Especially because of the way it has always been with that disconnect because of the railway tracks. But this, I 100% agree, from an investment standpoint I think investors, their future tenant, that everybody stands to gain from this. I wanted to talk about the neighborhood on a grander scale now as well. Because we touched on it a little bit, but there’s been a lot of changes within the neighborhood itself. Amit Bhandari: Retail especially. Before, I remember, way back when, 2009/2010, there wasn’t really much life other than just condo building, after condo building, after condo building. But we’ve seen transformation. Amit Bhandari: I wanted to get from your perspective, cause considering you’re building one of the biggest developments here. Amit Bhandari: You’ve already built other developments in the past. You’ve seen what it was in the past, I’m very curious to hear your take on where you see it going into the future, this pocket. Dan Flomen: Well it’s interesting because when I first started working here there was virtually no retail. There was one restaurant even down here. Now we’ve got multiple restaurants. Great shopping. New businesses coming into the area. The Queensway, which is a stones throw away from the Phoenix development, it’s gonna be packed full of newer retail. There’s still some big boxes, you still have the Costco’s. But you’ve got some beautiful little butcher shops and quaint restaurants, walking distance from the Mystic Point community. Which is such an amazing thing to have. But also, you’re only a 20 minute ride to downtown Toronto. So for those people that don’t want to live and work in the downtown core, this is a great option for them. You also don’t necessarily feel like you’re in the city when you’re in this area. Dan Flomen: You’ve got a lot of greenery. A lot of trees. And again, you’ve got the Lake right here. Dan Flomen: And that’s incredible. Amit Bhandari: I always tell my parents, cause this is an area that we’ve suggested to them, and the way that I’ve always put it is it’s like you’re always on vacation. Dan Flomen: Oh yes. It’s amazing. In the summer especially, to walk around down here, is magnificent. But even in the winter, on a nice day, it’s stunning. It’s stunning down here. Dan Flomen: It’s spectacular. Spectacular. Amit Bhandari: CN Tower, the changing post guard. Dan Flomen: Well there’s water everywhere around here, that’s another advantage. It’s not like, “Oh the water, to see the water I’ve gotta look through a bunch of buildings and I’ve gotta walk down there.” Here, the water is everywhere. Amit Bhandari: Yeah. Wonderful. So exciting. So I wanted to now transition over to the project itself. 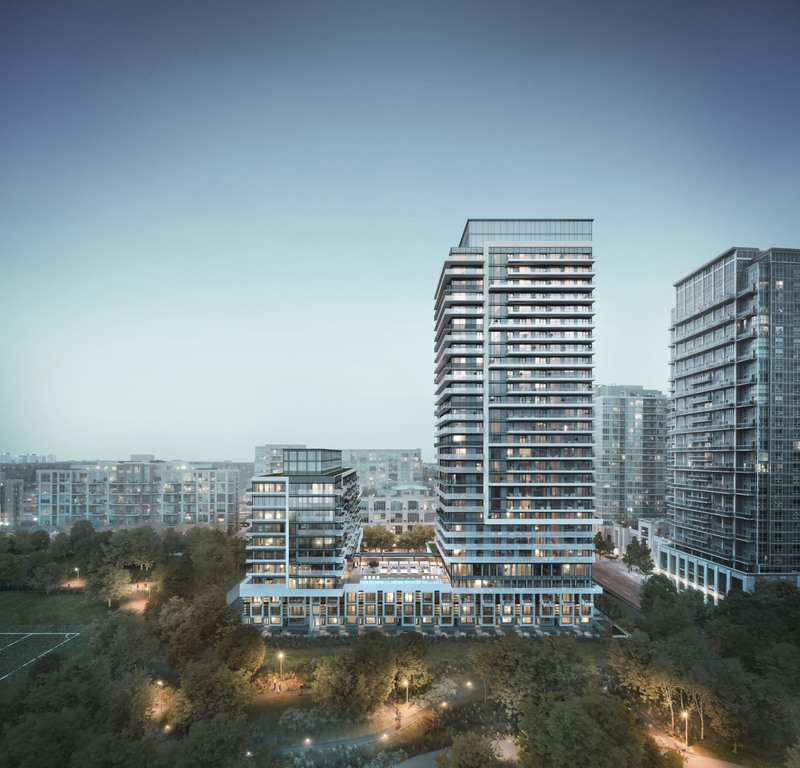 Amit Bhandari: Phoenix Condos, which actually is not to far from here. Amit Bhandari: So you’re gonna get wonderful views, you’re not gonna miss out on any of that. What can you tell us about Phoenix? Dan Flomen: Okay, so Phoenix, we spent a lot of time designing a building that would both suit the neighborhood, as well as the buyers that we know that are gonna move into here. And what I mean by that is it’s a 499 unit project, with two towers. There’s a 29 story and then a 10 or 11 story tower, connected by a podium. But on the lower part of the podium are two story, what I’m calling garden units. They’re not really a town home, but it’s a two story house with its own front door out. And they will wrap around the whole perimeter of the building. This building will not have any retail at the base. It’s very important to know that it’s a pure residential community. Okay. What does the building have itself? Dan Flomen: It’s got everything you would want in a building. First of all, two sides of the building face onto park lands. To, one side of the building, for lack of a better word, we’ll call it the South Side, in the distance you’ve got Lake Ontario. So from the eighth floor and up, not only are you overlooking a park, but then you’ve got these great vistas of Lake Ontario. On the fourth floor we’ve got a beautiful infinity pool that overlooks the park. Dan Flomen: Which is gonna be stunning. But what makes this pool different is it’s a pool that you would see in Las Vegas or Miami. So you’ve got a waving area of maybe eight inches of water, so you can sit there sit on your chair there, and then you’ve got the drop down to four feet. So you’ve got that real Miami/Vegas experience in this building. Dan Flomen: Of course, you’ll have an amazing gym and you’ll have a wonderful party, rework, open concept area. You’ll have all the things you want in a downtown building, here, but with the added advantage that if you walk out your door and you’re on a park. You wanna walk your dog, there’s a great dog run area. It will be a pet friendly building also. Dan Flomen: And one of the key components about buying here is there will be parking available for every single unit in the building, even the smallest units. Dan Flomen: Which start in the low 300s. Dan Flomen: So you’ll have parking with all of those units. Dan Flomen: It’s completely confidential, but since it’s you, I’ll tell you a little about pricing. So if I was gonna say an average of the totality of the project, you’d be looking around 775 dollars a foot. Parking and locker included. Which is the game changer there. Dan Flomen: And you’ll have your nine foot ceilings, and you’re gonna have all of the beautiful things that make up these buildings. We do have some lower floor units with eight and a half foot ceilings, and the price will be adjusted accordingly for those ones. But the reality is between and eight and a half and a nine foot ceiling. You know what, you’re really gonna not notice it that much if you’re five foot six like me. Amit Bhandari: This is incredibly exciting, especially, I mean the things that we’ve touched on, it’s location. The future extension of Legion Road, how it connects Mystic Point to Mimico, to Humber Bay, making the project accessible. Of course, we talked about how easy it is to get to and from the project. It’s about 20 Mississauga, 20 minute from downtown Toronto. Dan Flomen: Yeah, it’s equidistant I should say from Mississauga. Amit Bhandari: Yeah, equidistance. You know, you’re gonna have walking distance to fantastic retail. Dan Flomen: I should also mention that if you do have people that are looking as an investment, the vacancy rate in this area is less than a half a percent for new condos. Dan Flomen: So I don’t foresee anybody having a vacant condo. Amit Bhandari: Yup. No, I agree. It’s becoming a very popular neighborhood to live in. Dan Flomen: Well you get a lot of young professionals living here. Dan Flomen: Back maybe about 15 years ago, or 20 years ago, it catered to an older crowed. Now it’s completely shifted over the opposite way. It caters to everybody, but it really does great things with young, urban professionals. Amit Bhandari: Amazing. Well Dan, thank you so much for your time, talking about Phoenix Condos. Dan Flomen: And I think you for coming to this loud environment. Amit Bhandari: We’re really excited, we’re really excited. One final thing. So if any of our investor clients are interested, what would they need to do? Dan Flomen: Well I think first they need to call you. Dan Flomen: No, you know what, the reality is you’re one of the top brokers in the city. We’re obviously giving you special access to suits within the project. Dan Flomen: Both units that will be great investments and great places to live in. Dan Flomen: And I think the first thing that they should do is contact you, you’ll contact me and we’ll make a marriage as they say. We’ll put them together in the best unit that suits them for the reasons that they’re purchasing. Amit Bhandari: Amazing. Dan, thank you so much. Dan Flomen: My pleasure. Thank you.